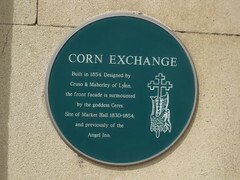 Corn Exchange Built in 1854. Designed by Cruso & Maberley of Lynn, the front facade is surmounted by the goddess Ceres. Site of Market Hall 1830-1854, and previously of the Angel Inn.